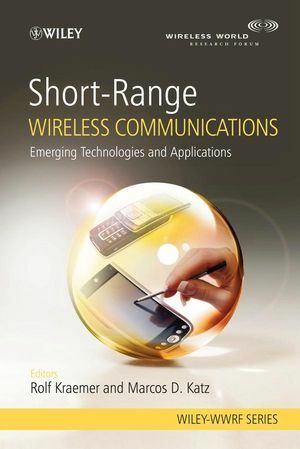 Short-Range Wireless Communications: Emerging Technologies and Applications summarizes the outcomes of WWRF Working Group 5, highlighting the latest research results and emerging trends on short-range communications. It contains contributions from leading research groups in academia and industry on future short-range wireless communication systems, in particular 60 GHz communications, ultra-wide band (UWB) communications, UWB radio over optical fiber, and design rules for future cooperative short-range communications systems. Starting from a brief description of state-of-the-art, the authors highlight the perspectives and limits of the technologies and identify where future research work is going to be focused. This book will be of interest to research managers, R&D engineers, lecturers and graduate students within the wireless communication research community. Executive managers and communication engineers will also find this reference useful. Professor Kraemer headed the department of Telecommunication Systems and Multimedia Services at Philips Research in Hamburg and Aachen from 1985-1998. Since 1998 he holds the chair of (wireless) systems at the Brandenburg Technical University Cottbus. Additionally, he is department head of the wireless multimedia communications department at the IHP (Innovations for High Performance Microelectronics) in Frankfurt (Oder). In this position he leads a team of 25 R&D professionals in Frankfurt (Oder) with core competence in communications, electronic and VHDL design, protocol and application engineering for wireless communication, and expanding into networking and multimedia.